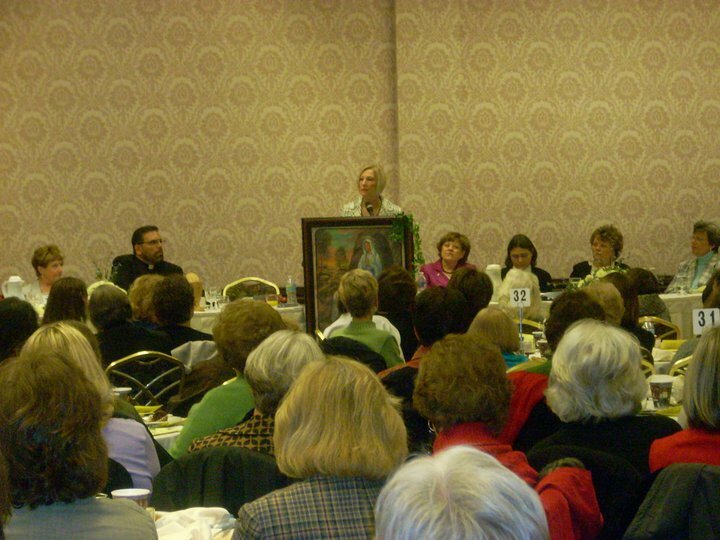 I had the privilege of spending the weekend of February 11 in Appleton, Wisconsin at the The Dignity and Vocation of Women conference held at St. Pius X Church. It was an awesome event! Organized by Jody Lueck, over 100 women gathered together for this inaugural event. The Feminine Genius Women’s Conference is sure to have a long and lasting history if this first gathering is the standard of things to come. For me personally it was yet another reminder of the great work God is about in the hearts and minds of His daughters. He is indeed pouring out graces for restoration, renewal, and revitalization. This was not lost on the women who attended. An attitude of receptivity marked their demeanor as well as that of the women who presented and the special guests who were invited. I was delighted to see Mercedes Wilson (Families of the Americas) whose work I so greatly admire and whom I hadn’t seen in several years. And I was so pleased to meet Jeannie Hanneman (Elizabeth Ministry International), Judith Leonard (Diocese of Wichita), Vicki Thorn (Project Rachel), Margaret Hartshorn (Hearbeat, International), and Rosemary Sullivan (Exec. Dir. National Conference of Diocesan Vocation Directors). What powerful women in the Lord! A Brooklyn judge has decided that a 17 year-old boy who has been in the custody of his well-paid mother all of his life, will now be better off living with his father – who is homeless and currently living in a city-run shelter. While addressing a conference of the National Religious Broadcasters Association, House Speaker John Boehner (R-OH) called the national debt a “moral threat” to America. Anyone who doubts the inevitability of the emergence of “death panels” doesn’t need to wait until ObamaCare is in full force. The rationing has already begun. What does it mean to attain “truth above creation and action?” In what practical ways can I begin to lead a more silent life – exteriorly and interiorly? I will make up a practical plan to implement this during Lent. Of the words I speak each day, what percentage do I speak to God and what percentage do I speak to creatures? Am I happy with these totals especially in light of the gift of wisdom? The powers of the soul are will, reason, and emotion. How can the “love of talk” draw these away from God? To what extent have I seen this to be true in myself? What practical strategies can I use to mortify myself of this tendency? Is it a sin to go to a tarot card reader?